Send a licensed, experienced, service technician who will thoroughly inspect your business and identify the best methods of controlling pests. Offer a customized service plan based on each individual client's needs. Guarantee control of all common crawling pests, including ants, roaches, spiders, millipedes, centipedes, scorpions, earwigs, springtails, fleas, ticks, mice, flies, and rats. Safe and effective service through integrated pest management practices. Educate your staff on the best practices to ensure continued pest management success. Our commercial pest control program consists of monthly or every other month service that is customized to the seasonal pest trends of Northern California. Using our integrated approach, not only is this effective in controlling pests, but it also helps prevent and reduce pest populations and makes your business a healthier more efficient environment! A fly infestation poses a serious hygiene risk. Unfortunately, flies are attracted to conditions found in restaurants, office cafeterias and other structures where food is prepared and where they can do the most damage. Sanitation is crucial in preventing flies from infesting. 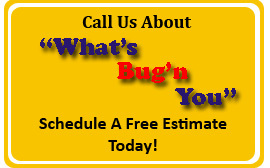 That said, Anchor Pest Control offers a separate service specifically designed to control fly infestations. Contact Anchor Pest Control to learn about their special fly control equipment, service and competitive pricing.